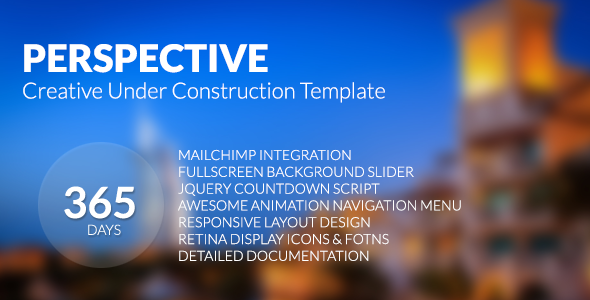 Perspective is a creative and modern under construction template with a full-screen background slider, countdown script, email subscription form (Mailchimp ready) all the features you need to create a stunning and functional coming soon website. It’s also incredibly easy to setup, even if you’re a beginner. The layout is responsive so your site will look great on any device, from small phones to big desktops. Item Reviewed: Perspective - Creative Under Construction Template 9 out of 10 based on 10 ratings. 9 user reviews.